A song to play while you’re reading about the White Sox: “Almost” by Bowling for Soup. White Sox fans went into the offseason uncharacteristically optimistic about the team’s chances to land either Manny Machado or Bryce Harper. As we all know, they didn’t — all the big spending talk and preparations led to nothing as the Sox wouldn’t match the Padres offer to Machado, only feeling comfortable guaranteeing $250 million, but not $300 million. So fans are left to look at the team in its current iteration in another year closer to the end of this rebuild. There are players on this team who will need to make improvements. Yoan Moncada will need to cut down on his strike outs as mentioned above, and he’ll also be moving to third base this year after playing second last season. Lucas Giolito will have to cut down on his walks — once a highly touted prospect, Giolito had 4.67 walks per nine, which ranked dead last in the major leagues among starters last season. Last year’s out of nowhere guy, Daniel Palka, will be fighting for playing time with the White Sox bringing in two of Manny Machado’s friends, Yonder Alonso (designated hitter and first baseman) and Jon Jay (right fielder), and Eloy Jimenez coming up from Class AAA after his defense gets fine-tuned, magically about two weeks after Opening Day. Reynaldo Lopez had a breakout season last year but will have to use his breaking balls more to induce more soft contact than his 20.8 soft contact percentage — he had the ninth highest percentage of fastballs among starters last season. White Sox fans should again be keeping a close eye on the minor leagues again this season, as that’s where most of the next division-contending team still is. As stated above, Eloy Jimenez will spend about three weeks in Charlotte until his defense is up to snuff (ed. note: his defense issues were magically cured the second he signed that big league contract). Last year’s minor league pitcher of the year, Dylan Cease, will be in Class AAA for most of the season and is expected to follow a similar path to the majors with a mid-August call-up, as Lucas Giolito, Reynaldo Lopez, and Michael Kopech were. Health through the minor league system is an area where the 2019 White Sox can improve upon the 2018 iteration also. Last season, Jake Burger tore his Achilles not once but twice. Luis Robert — the big international free agent signing from 2017 — has been marred by injuries to his hand, knee, ankle, and hamstring injuries in his first two professional seasons. And Miker Adolfo missed the last two months of 2018 with Tommy John surgery, after not playing the field due to the torn UCL all of 2018. Michael Kopech had Tommy John after four starts and Alec Hansen completely derailed after coming back from forearm soreness that lasted for two months. Already this season, Dane Dunning has a visit to Dr. Andrews scheduled, so it’s not off to the best start, as guys who are recovering from injuries rarely make large strides in their development during injury rehab. Dunning had a real shot at being the team’s fifth starter this season, but the fear is not only will he not be the fifth starter, he may also lose a year. What is the White Sox’ most recent accomplishment? The White Sox proved they were ready to spend on a franchise centerpiece, being in on the Manny Machado sweepstakes until he signed elsewhere. Many reports had the White Sox as the runner up for him, falling $50 million guaranteed behind the Padres. 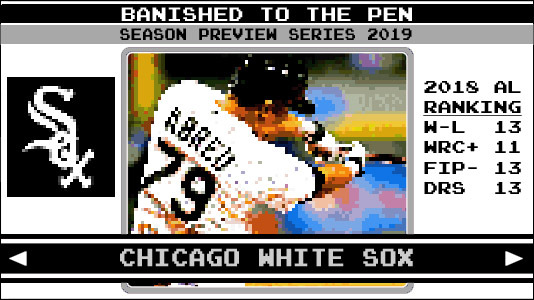 How will the White Sox define success in 2019? The 2019 White Sox’ success will be as much in the development of players already in the big leagues and those soon to come than the actual record. Unfortunately, the White Sox are still looking towards the future and need development in guys like Lucas Giolito and Yoan Moncada at the major league level. They are also looking to see jumps forward from guys like Eloy Jimenez, Miker Adolfo, Luis Robert, and one of the catchers, either Zach Collins or Seby Zavala. You may have heard of a guy named Yoan Moncada, who was MLB Pipeline’s number one overall prospect in 2016 when he was traded to the White Sox. Well, Yoan has been up in the bigs for 203 games with the White Sox and last season he had 217 strikeout — a 33.4 percent strike out rate. While that is a lot of strikeouts if you look deeper at the numbers you see that Yoan Moncada had a lot of called third strikes. He actually had the most called third strikes in all of baseball, with 85 (29 more than Chris Davis who was in second). Peeling back one more layer you see that a quarter of those called third strikes was actually outside the strike zone. He lead the league in those too with 22, four more than Matt Chapman. Yoan can possibly cut down the strikeouts by swinging earlier in the counts. On Thursday, May 16th, you’ll receive a t-shirt commemorating Mark Buehrle’s perfect game almost ten years later. The tee is the famous picture of Buehrle with his glove and hands on his head with the word Perfect interwoven across the jersey with the 56 taking the place of the “ec” in perfect.